The Radium Engineering Port Injection Kit (PIK) installs between the intake manifold and the cylinder head and permits the use of port injectors to add additional fuel for high-horsepower modified K20C1 engines, commonly found in the FK8 Civic Type-R. This does NOT replace the OEM direct injection system. 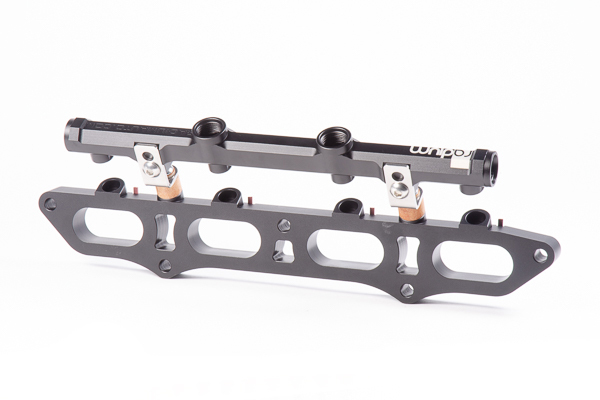 The kit includes the PIK adapter plate, custom fuel rail, fuel rail mounting hardware, and OEM Honda gaskets, as shown in the below picture. It is compatible with all fuel types including popular alcohol mixtures such as E85. The fuel rail features a large 0.63" internal diameter bore. It is CNC machined from extruded 6063 aluminum and laser etched for a high quality surface finish. All 4 ports are machined with an 8AN ORB (3/4-16 female) threads. 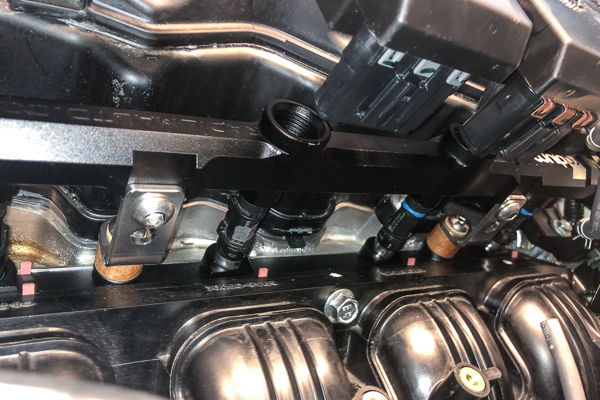 Note that the 2 top fuel rail ports will need to be plugged with 14-0150 unless the plastic OEM wiring harness carrier is modified (see below). For a list of all 8AN ORB adapter fittings, go HERE. 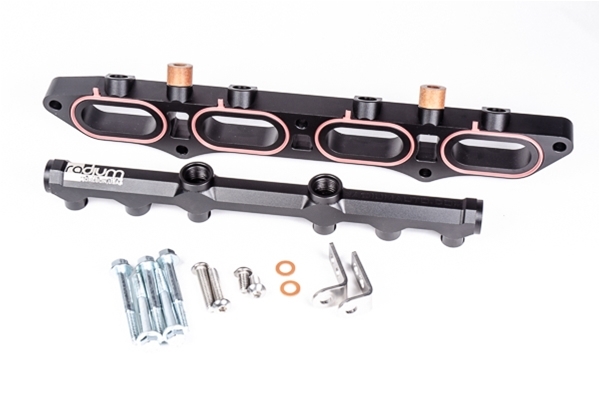 Machined phenolic mounting spacers and washers are included to completely isolate the fuel rail from heat created by the cylinder head and transferred through the mounting bolts. The injectors are at a specific angle to ensure proper spray into the intake ports, as shown below. This kit is designed for specific top feed fuel injectors with upper and lower O-ring spacing, as depicted below. The upper and lower injector O-rings must be 14mm diameter. The included fuel rail mounting brackets permit 2 different height fuel injectors to be used, as shown below. FUEL INJECTORS ARE NOT SOLD BY RADIUM ENGINEERING AND MUST BE SOURCED ELSEWHERE. Consult the fitment guide below before purchasing injectors. Below are some of the many fuel injectors that are a direct fitment when using the upper holes of the mounting brackets (48mm height injectors). 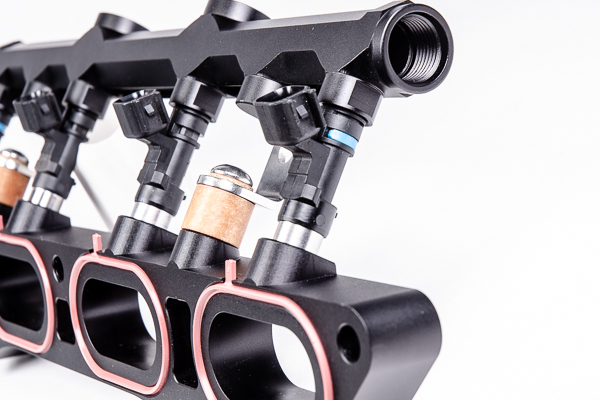 If you are unsure about what injectors to purchase, contact your favorite injector manufacturer and provide them the information on this page to find compatible products. 1. Fuel injectors, port fittings, fuel hose, wiring, injector controller, etc. are NOT included and must be sourced elsewhere. 2. Because the PIK will space the intake manifold off the head, a custom throttle body pipe will need to be fabricated. Alternatively, 11-0027 Silicone Coupler can be used with OEM throttle body pipe.